It began as a long distance romance…I can’t recall when I first encountered a Williams-Sonoma catalog, but it was at least in the early 90s…long before I ever went into a Williams-Sonoma store or before there was a website. In the early days of my infatuation, the catalogs were smaller and not as elaborate as the current style. As I recall, they were about half the size of the magazine format that the catalog sports now. But even then, each edition was a passport to wonderful culinary products. Understand, I didn’t experience the pleasure of shopping in unique kitchen stores until I was a young adult. There simply was no such establishment in the region where I grew up. Granted, no matter where one grew up, retail shopping has come a long way. The internet has added opportunities for buying that were unimaginable only a few years ago. When I lived in the Alaskan Arctic, I regularly ordered items from Williams-Sonoma, and they arrived like clockwork, even at the top of the world. Most of my actual purchasing is done online, unless I’m lucky enough to be in the vicinity of a retail store…something that doesn’t happen often enough these days. I got spoiled to the ease of going to their retail locations when we lived in the foothills above Denver. There were multiple Williams-Sonoma stores in the city, and it was always fun to visit at the beginning of a new season to check out the most recent cookware, gadgets, and receipes being showcased. But I have to say, even though there are benefits to visiting the stores in person, I get more actual enjoyment from a leisurely reading through the catalog. (Maybe this is where some would think I need a life?) But honestly, if you love to cook, how could you resist these pages with the most beautiful cookware, dishes and linens? And for gadget lovers, there are always new and unique items to catch your eye and fancy. What will they think of next? The photography is delicious, there are recipes scattered throughout the pages, lovely staging options for tablescapes (for all my elaborate entertaining) and in some editions, pages and pages of the most delectable foods to order, either for gift giving or for your own use. I have never had a bad experience with this company. The food items I’ve ordered have been received with rave reviews. 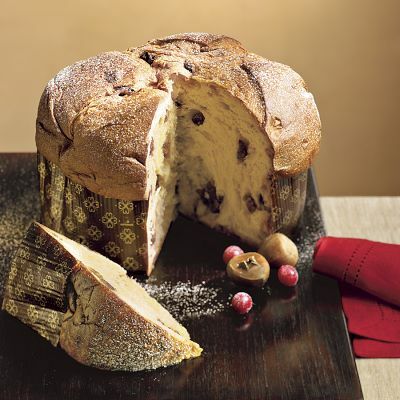 I can personally attest to the yumminess of the Panettone, but most of the food I have ordered has been given as gifts. Their customer service is great and the quality of products as well as food is amazing. However, back to browsing…if you don’t receive this catalog, go to their website or give them a ring and request it. It’s a wonderful way to find some inspiration for your next family food event or to challenge yourself to try some new culinary adventure. I highly recommend curling up with the latest catalog in the evening, cup of comforting hot tea at your side, and drooling a bit over the pages that make kitchen work seem exciting, even glamorous. Before you know it you’ll be making your wish list and dreaming of new culinary achievements, spurred on by the inspiratrion of beautiful images, lovely products, and enticing recipes. By the way, you can access a plethora of Williams-Sonoma reciepes on their website and save them to your digital receipe box. The ones I’ve tried have been keepers.